I am sitting in my office in Cairns. When I look out of the window I can see dark clouds hanging in the sky, bringing with them the beginning of the wet season. As our remote field sites can only be accessed by dirt road, these clouds indicate the end of our field season 2016. But what an amazing year it has been! 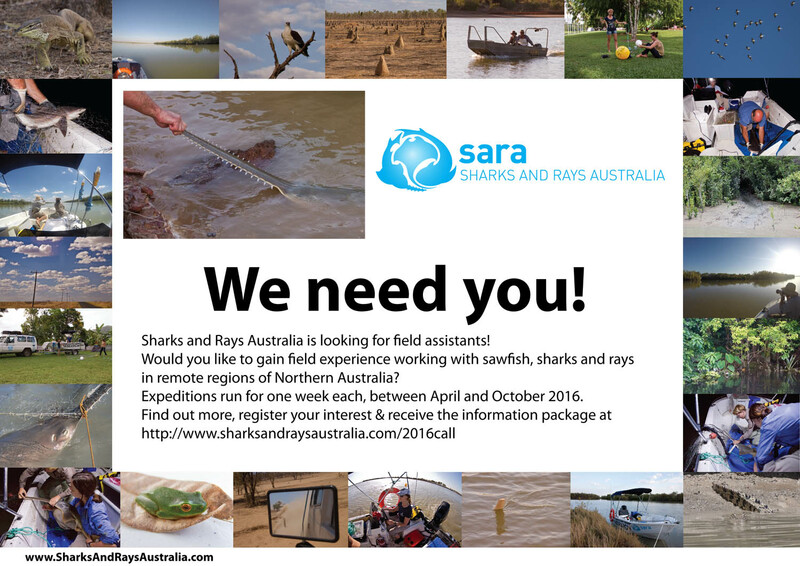 In 2016, Sharks And Rays Australia commenced expeditions with volunteer field assistants. The response to our call for field assistants at the beginning of the year was fantastic, especially for the fact that this was our first year. People from all over Australia joined us in the field, many of whom were biologists. We have also been joined by Indigenous Rangers in the field. SARA is now collaborating with five Indigenous Ranger Groups, and their help in the field is invaluable. These guys know their country like the back of their hand, and helped us overcome the many logistical challenges such as launching the boat in areas where there are no boat ramps. They also know which areas are inhabited by particularly large crocodiles and showed us how to read the depth of the river based on the surrounding terrestrial vegetation. Their interest in sawfishes and our research was also incredible, which is very encouraging. For example, the Kowanyama Land and Sea Rangers joined us in the field and on the boat, and almost every one of the Gangalidda-Garawa Land and Sea Rangers joined our presentation and induction. These collaborations make our work more fun and exciting but they are also important. After all, the majority of Queensland’s rivers in which sawfish are likely still abundant, are bordered by country that is under Native Title claim. Together, we have discovered many amazing places in the Queensland tropics that are completely off the beaten track. 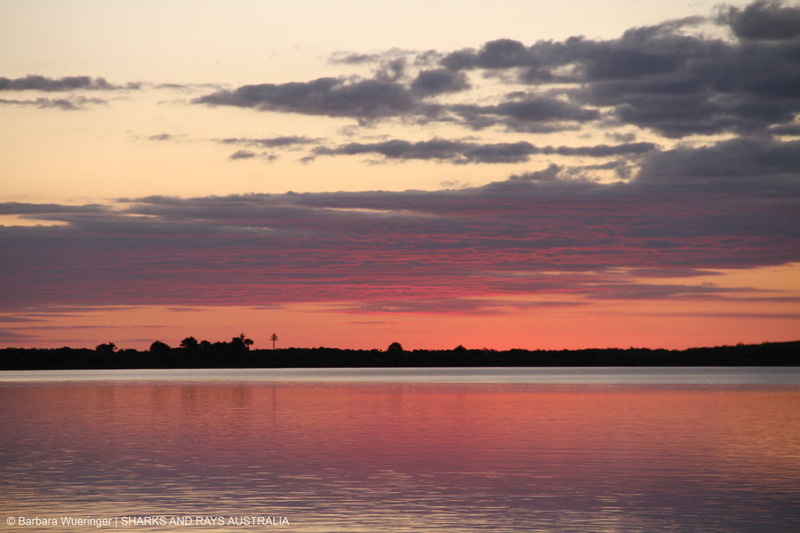 We have commenced our study in seven rivers that all flow into the Gulf of Carpentaria, from near the Northern Territory border in the west to north of Weipa. We have experienced an abundance of wildlife, from swarms of grasshoppers, to snakes crossing rivers, to iconic Australian species such as goannas, kangaroos and emus. Our fieldwork was often done under the watchful eyes of saltwater crocodiles and wedge-tail or white-bellied sea eagles. We rescued blue-tongue skinks and pythons that were sunbaking on the roads, and stood in awe of corypha palms that were in bloom. How I miss sitting by the campfire and listening to the songs of whistling kites. The landscapes we have worked in have been truly stunning and unique. From the endless salt marshes of the Nicholson River to the grasslands that surround the Mitchell River. But we have also seen at first hand the large-scale mangrove die-offs that nobody talks about. It is yet to be seen what these die-offs mean for so many fish and also sawfish that use these submerged forests as nursery grounds. We also caught, tagged and released 49 elasmobranchs, belonging to seven different species. The most commonly caught sharks were juvenile bull sharks Carcharhinus leucas, with 25 individuals, followed by freshwater whip rays Urogymnus dalyensis, with 6 specimens. Sampling in coastal regions did not get us any of the elusive Queensland sawfish Pristis clavata or Green sawfish Pristis zijsron but we caught, tagged and released five freshwater sawfish Pristis pristis. The diversity of elasmobranch body shapes was reflected in our samples, with juvenile giant shovelnose rays Glaucostegus typus as well as juvenile eagle rays Aetobatus ocellatus being caught. But we have also found evidence of sawfish being finned – a practise that is illegal for anyone in Australia. As we are not only aiming to understand our study species but also gain a better understanding of the ecosystems they occur in, we also analyse our by-catch, almost all of which was released alive. A total of 276 fish were identified, measured and released! By-catch was clearly dominated by fork-tailed catfish, and within that group Sciades paucus the shovelnose catfish took the lead. These results clearly show that gill nets and drum lines are only selective by size and not by species, but our sampling strategies have also proven to be effective in ensuring that most animals are released alive. Our field assistants have brought many skills to our expeditions this year, and they have also learned many things, about our research, sawfish, our methods and also about themselves! Spending time in relatively untouched, remote ecosystems often brings us back to ourselves and exposes our strengths and fears. But as a team we can overcome these challenges and learn from each other. In 2017 SARA will expand even more. We will continue to run our project on the assessment and distributions of sawfish and other sharks and rays in our study area. With this we will continue to collect DNA and stable isotope samples, and we are hoping to explore more rivers. We will help Mangrove Watch assess the state of the mangrove forests that we work in, and we will commence sampling rivers for environmental DNA (eDNA) of sawfish, in collaboration with Prof. Colin Simpfendorfer from James Cook University. We also hope to increase our presence in local schools, not only showing kids what we do but also introducing our food web game that will be developed in collaboration with Sharks4Kids. We are hoping to commence trials for new methods of capturing sawfish. And hopefully SARA can grow, as we will be seeking students to take over some of our projects, like the stable isotope study of river food webs, and our accelerometer study of sawfish behaviours. So stay tuned, join our newsletter and regularly check into our facebook page!